The ultimate in comfort food -- a candy pillow! Much like the Double Bubble Gum bead pillow (which I own), Dylan's Candy Bar has added some new confectionary gems to their housewares collection. 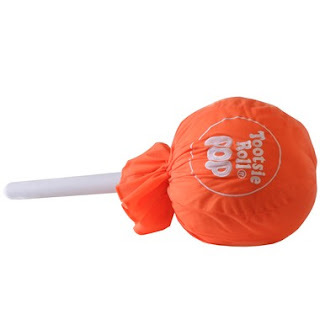 This giant Tootsie Pop caught my eye for its fresh look and typical non-pillow shape. Personally, Tootsie Pops are not my first choice for a sugar rush but as a living room accent, I'm so there!